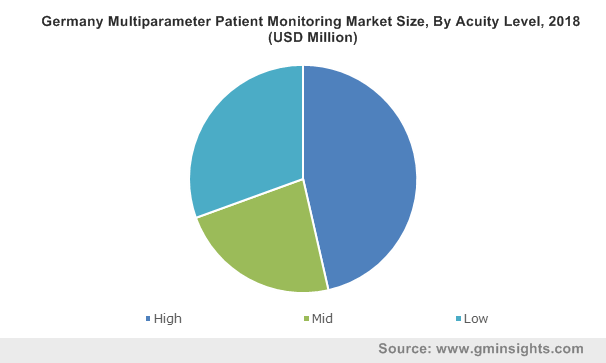 Multiparameter Patient Monitoring Market size was valued at USD 8.7 billion in 2018 and is expected to witness 3.9% CAGR from 2019 to 2025. 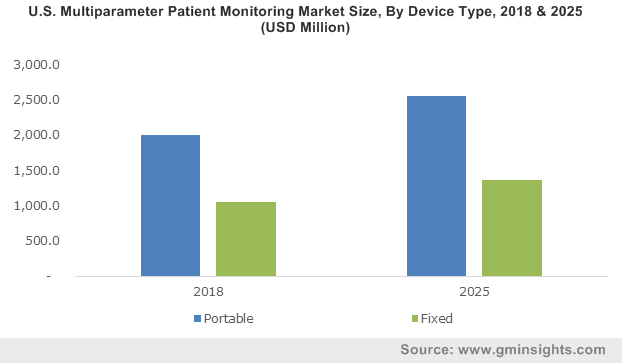 Rising prevalence of chronic diseases such as cancer and diabetes in developed as well as developing regions drives the demand for multiparameter patient monitoring devices. For instance, according to WHO, around 18 million new cases of cancer have been diagnosed as of 2018 globally. Moreover, prevalence of endocrine diseases such as diabetes and hyperthyroidism are specifically high in emerging economies and these diseases result in chronic conditions that requires surgeries and critical monitoring of vital parameters. Also, favourable demographic trends such as growing geriatric population susceptible to infections and diseases has positively impacted the market growth. 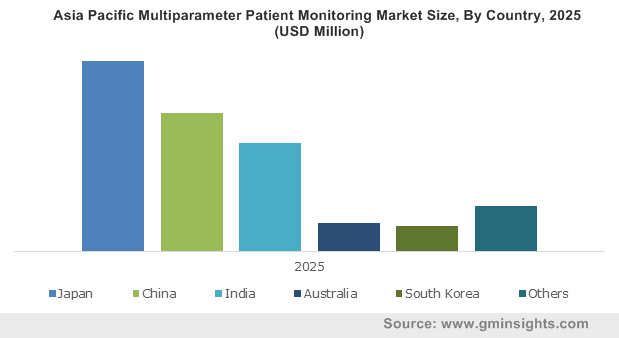 Increasing awareness regarding availability of technologically advanced multiparameter patient monitors in developing countries such as India and China will surge the industry growth in foreseeable future. Government in developing countries undertake several initiatives that improves the awareness level amongst the doctors regarding the availability of efficient multiparameter monitoring devices allowing faster patient recovery. Also, developing regions are price sensitive and hence, government and regulatory authorities undertake several initiatives to lower the price of multiparameter monitors that resolves affordability issues and proves beneficial for the industry growth. However, stringent regulatory landscape may hamper the multiparameter market growth up to some extent. Portable monitors was valued at USD 5.7 billion in 2018 and is expected to retain its dominant position in industry throughout analysis period. Portable multiparameter monitors developed by key industry players have improved accuracy and enables patient’s speedy recovery. Moreover, compact size increases the preference for portable patient monitors in ASC’s and even at home. Aforementioned factors coupled with high operational efficiency possessed by multiparameter patient monitors promotes segmental growth. Low-acuity multiparameter patient monitors segment is expected to grow at 4.1% throughout the analysis period. Low-acuity monitors usually have high preference in ambulatory surgical centres and hospitals covered under public sectors as they have low price as compared to the high-acuity multiparameter patient monitors. Also, price sensitive regions such as Asia Pacific will have considerable adoption of low-acuity patient monitors that will prove beneficial for the segmental growth. Geriatric segment was valued at USD 3.3 billion in 2018 and is expected to grow significantly in the foreseeable future. Countries such as China and Japan have large elderly population base that positively impacts the demand for recently developed portable multiparameter patient monitors. Geriatric population is susceptible to chronic diseases such as cancer, diabetes and respiratory infections and requires continuous monitoring. Portable multiparameter patient monitors possess operational ease and are extremely accurate that drives its demand in the treatment of elderly population base. Hospital segment accounted for USD 3.7 billion in 2018. Hospital segment has enormous revenue size as the demand for multiparameter patient monitors is relatively high in the intensive care units of hospitals. Furthermore, hospitals in developed countries are well-equipped with medical devices that raises preference for hospitals for intensive care cases. Ambulatory surgical centres segment estimated to witness 4.1% growth from 2019 to 2025. Adoption of technologically advanced portable multiparameter patient monitors is comparatively high in ambulatory surgical centres. Also, low-acuity multiparameter patient monitors find high preference in one-day surgeries that are less critical and carried out in ASC’s that impels the business growth in upcoming years. India market is estimated to grow at 4.6% from 2019 to 2025. Considerable industry growth is due to the increasing demand for high-acuity multiparameter patient monitors in intensive care units. India is an emerging country with large elderly population base that suffers from chronic diseases and infections that proves beneficial for industry growth. 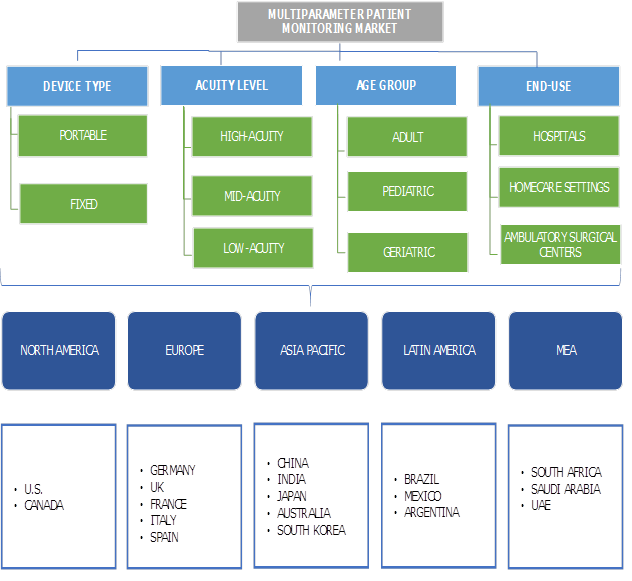 Some of the key players in global multiparameter patient monitoring market are Epsimed, KizlonMedical, Mediana, Medion Healthcare, Medtronics, Mindray, Opto India, OSI Systems, Philips Healthcare, Skanray Technologies, Spacehealth Labs and VOTEM. Prominent industry players adopt strategies including acquisitions, mergers, distribution agreements and innovative product launch to strengthen product portfolio and garner higher market share. For instance, in November 2016, Philips entered into an agreement with Masimo to expand its offering in patient monitoring devices. Multiparameter patient monitoring market can be traced back to 1960’s that initiated with the development of physiologic monitors and has evolved drastically over the past few years. In early 1960’s with the concept of ICU rooms, patient monitors with ability to analyze major parameters were introduced. The first successful system developed was Technicon Information Medical system made in 1965. Later, key industry players such as Medtronic, Philips and GE Healthcare have integrated advanced technology within the multiparameter patient monitoring devices that have enabled accurate and efficient monitoring of patients on several parameters. Nowadays, companies provide complementary solutions and software that are required to analyze the information derived from the monitors. Although the market is in matured phase, companies operational in this industry try to introduce innovations by creating product differentiation. This scenario has helped in replacing the conventional single parameter monitoring devices with recently developed technologically advanced multiparameter patient monitoring devices that has proven beneficial for the industry growth.